This incredibly fast and remarkably beautiful road race takes runners from the lush mountainsides and high meadows of Hawaii's Mauna Kea to the lava fields and beaches of Waikoloa. Featuring a smooth downhill slope and spectacular scenery, this race will be sure to help you set your PR and finally hit that Boston Qualifying time. REVEL KÅ«lia is the fastest and most beautiful marathon and half marathon in Hawaii. REVEL in speed. REVEL in beauty. REVEL in PARADISE! Every REVEL event is named after a feature of its geographic location, landmark or cultural history. Because the process of creating names is very important to Hawaiian people, culture and religion, we enlisted the help of Hawaiian KÅ«punaÊ»s from Kona and KeÊ»ei, HawaiÊ»i, to share the manaÊ»o (idea or belief) to decide on a name for this race. After learning about our race route and the history of the REVEL Race Series, the Hulu KÅ«puna (Esteemed Elders) sanctioned the name from a Hawaiian proverb that is the motto of Queen KapiÊ»olani: âKÅ«lia i ka nuÊ»uâ - meaning "Strive to reach the summit". Mauna a WÄkea is the summit and highest mountain in the Pacific Ocean and KÅ«lia is very befitting for REVEL to be named as the race will be on the bottom of the summit and participants will witness this Majestic Mauna (mountain) as a challenge to strive! KÅ«lia for REVEL means to exert oneâs strength and strive fast. The name is perfect for the fastest marathon course in the world! How do you pronuance KÅ«lia? Extremely well organized. The buses, aid stations, bib pickup, all were great. The blanket really helped at the start. Incredibly well organized from start to finish. Great volunteers. Beautiful course. Best marathon experience I've had. This race was so fun!! I definitely want to do it again! Great views! Downhill running is fun. I got a PR. The medal is huge! Thanks for making everything so easy - website, race info, expo, blankets and gloves for start line, plentiful hydration stations, course safety, etc! I hit my goal of a sub 3 hr. My previous PR was from Revel Big Cottonwood. This is a great race to hit your PR! After the race, there was PIE. I mean, really, who does that? Did you PR? Yes by far this was my best time. The scenery was amazing! Throughout the entire race I would look to my left or right and check out the vast landscape. 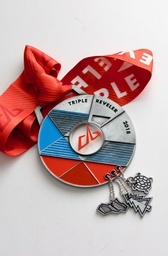 Run any 3 REVEL races (full or half marathon) in a calendar year to receive a special edition Triple REVELer medal. You will be in an elite company of REVELers who keep coming back for more!